Sometimes it’s just easier to start with the little messes before some of the bigger ones. Our home office tends to become a dumping ground for soooo many things in our house. The number one thing that gets dumped here so quickly is paperwork. It just adds up very quickly and can get out of control very easily. 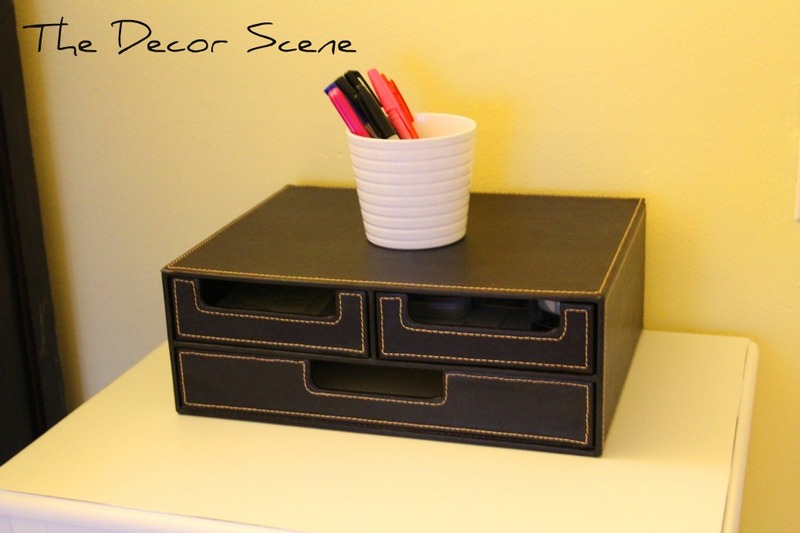 Here is a small drawer station that is located on top of our file cabinet. It was supposed to be used for important paperwork we wanted at hand, bills and some supplies. Well it was out of hand and I had to clean it out. Basically, I went through everything on the top first and then each drawer. It took be about 1/2 hour total to go through everything and figure out if it was garbage, recycle or needed to be filed. I ended up with this. All cleaned up and organized. See how you can’t see the paperwork inside the drawers anymore. Yup that is how full these drawers were. For me, if the little things are organized, then I can move onto the bigger things. It just works for me that way. So let’s look at what I didn’t organize yet. Yikes this is a really big job and I’m just not ready to tackle it yet. 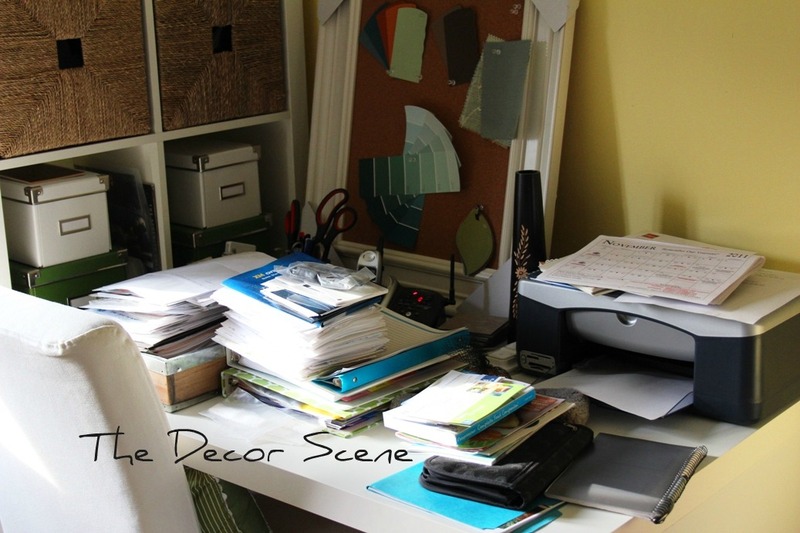 I’m trying to organize my home office, one project at a time….one area at a time. 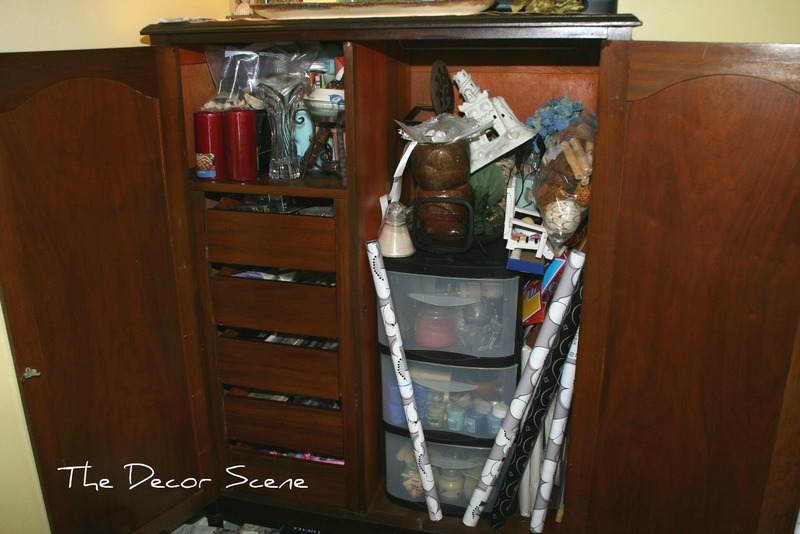 This armoire is right next to the file cabinet. It was my Grandmother’s and now it’s mine. I want to paint it one day, but that is a large project for me and I will have to find the right time for that. But I will be sure to share with you when and if I do. So now you know my house isn’t always cleaned up and organized. I try to organize my life one little area at a time. Let’s take a look inside. It already has some built in storage, but I don’t untilize them well. 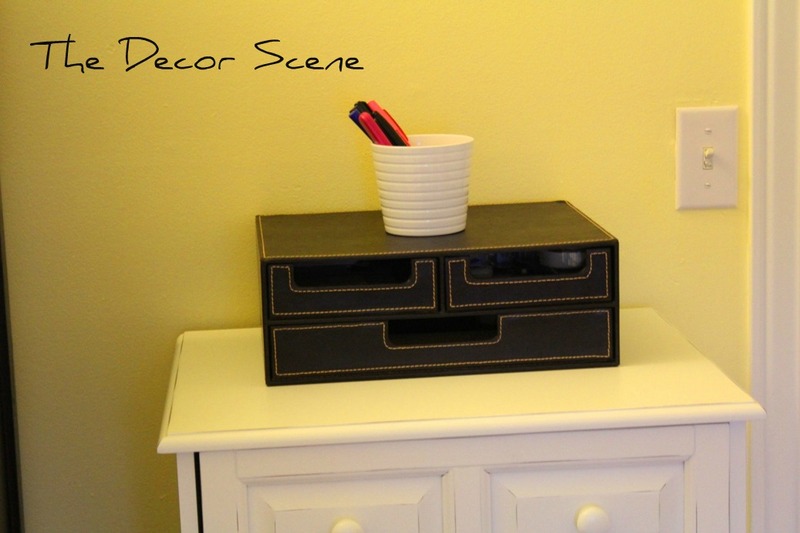 I need to re-think these drawers and what I use them for. So I will need to take everything out of the amoire and start over again. I would like to turn this into my “extra decor” cabinet. I’m really dying for a cabinet to holds all my extra decor pieces that I have around the house, stored in different places. I added some storage. But it is just not enough. 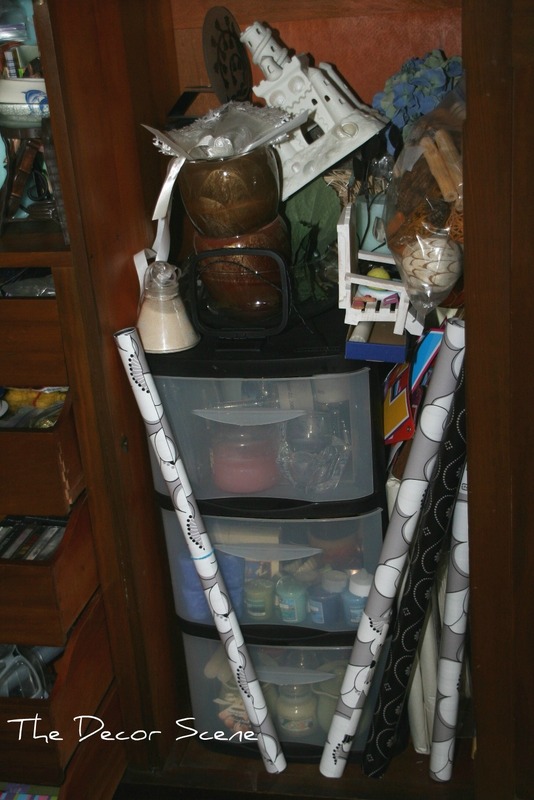 Ok, maybe I have too much stuff and I need to get rid of even more stuff. 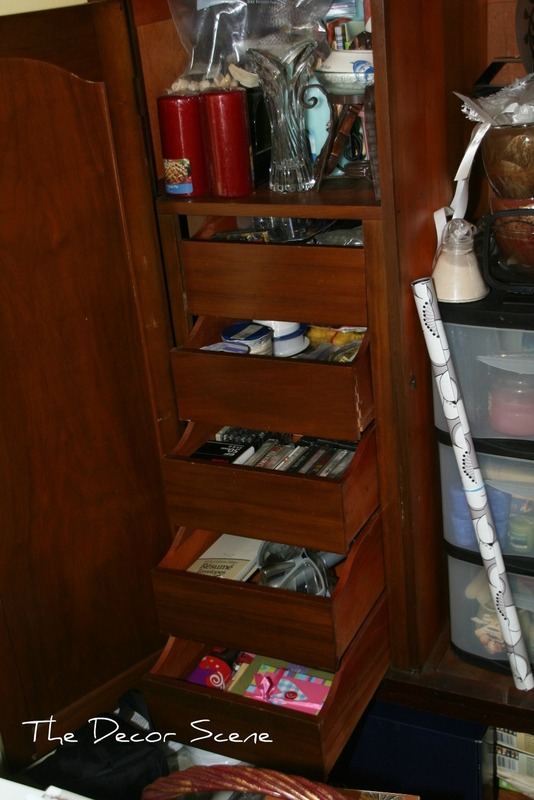 But I do need to rethink this side of the cabinet and get better store or utilize the storage I have already in a better way. 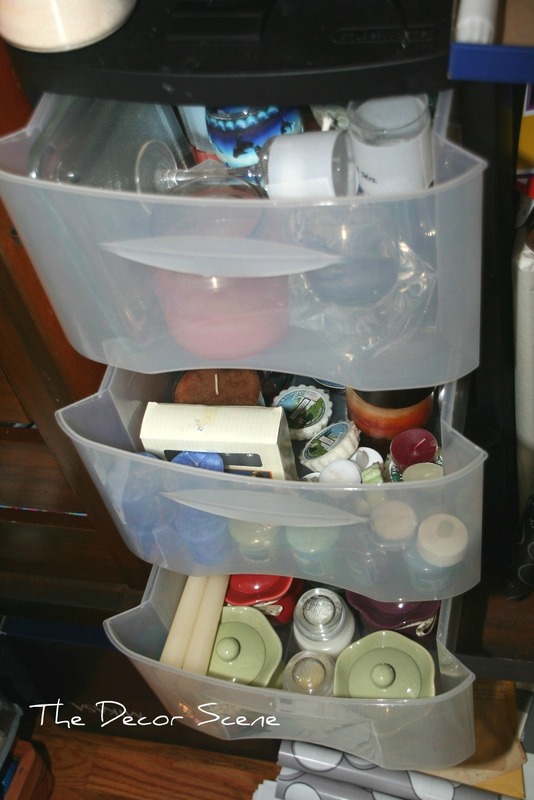 This storage holds candles & candle holders only. Think I have a candle problem? I need to garage sale some of this stuff. And let’s not talk about my desk…it’s partically organized, but when trying to clean up the floor in the office, this is what happened to the desk area. Yup it went from the floor to piles on the desk…then I ran out of steam for that day. I will sort through things and it will be cleared soon. I also have to hang that cork board. I want to use it as a “mood board” for projects in the house. To use it in a way so I don’t forget my vision for a room or a project. I can’t wait to hang it up. Anyone organize anything this weekend? Do you have a paperwork problem? Do you have a candle problem? Let’s hear it all ladies!!! I love to hear from you, so please leave a comment and let’s hear about your weekend. What did you do this weekend? I have a spice problem and I finally organized them this weekend. Its frustrating thinking that you don't have a particular spice and go to the store to buy some and later come home to find that you did indeed have some.